Webliquidinfotech provides the best PPC Training in Chandigarh, Mohali, Panchkula. Our Google AdWords Training is as per the current industry standards. Our training programs will permit professionals to secure placements in MNCs. 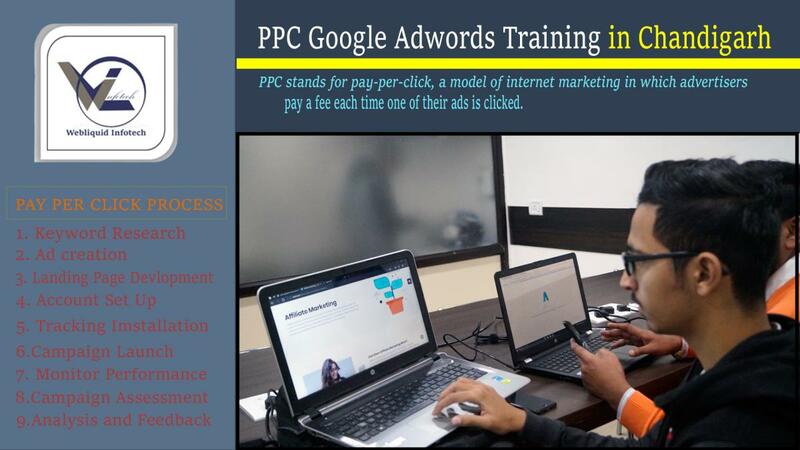 Webliquidinfotech is one of the most recommended institutes for PPC Google AdWords Training in Chandigarh that offers hands-on practical knowledge practical implementation on live projects and will ensure the job with the help of advance level Google AdWords Training Courses. At Webliquidinfotech PPC Training in Chandigarh is conducted by specialist working certified corporate professionals having loads of years of experience in implementing real-time Google AdWords. Webliquidinfotech is a well-equipped Google AdWords Training Center in Chandigarh. Candidates will implement the following concepts under etc on real-time projects along with Google AdWords Placement Training modules like aptitude test preparation etc. Webliquidinfotech is the well-known Google AdWords Training Center in Chandigarh with high tech infrastructure and lab facilities. We also provide online access to servers so that candidates will implement the projects at their home easily. Webliquidinfotech has mentored more than 3000+ candidates with Google AdWords Certification Training at a very reasonable fee. The course curriculum is customized as per the necessity of candidates/corporates. Generally, people are not sure whether they should join an institute for Google AdWords Training in Chandigarh or not because their concern is the post-training support. Webliquidinfotech is the only institute that will always provide full assistance to the students even after completing their certain course. We understand that you may have some difficulties when you are on your own and these free one to one sessions will confirm that you get all your uncertainties cleared. We will be with you on your journey to success. We understand that you are busy with a lot of stuff and that is why we plan the Google AdWords training sessions as per your availability. Before we start the Google AdWords Classes the schedule will be discussed with you. If for any reason you can’t attend a particular session just inform us at least 3 days before and we will reschedule your session. In addition to this, our classrooms are built-in with projectors that enable our students to understand the topic in a simple manner. Webliquidinfotech is one of the best Google AdWords Training Institutes with 100% placement support. Our strong associations with top organizations like HCL, Wipro, Dell, Birla soft, TechMahindra, TCS, IBM etc. makes us capable to place our students in top MNCs across the globe. We have placed thousands of students according to their skills and area of interest that makes us preferred Google AdWords Training Academy. Next, we closely monitor the growth of students during the training program and assist them to increase their performance and level of knowledge. PPC is basically one of the modules included in our digital marketing Training in Chandigarh. PPC for Google & Bing Search Engine. Branding & Conversion Objective in PPC. CPC-based, CPA-based & CPM-based accounts. Website & Competitor Analysis for PPC campaigning. Understanding Client’s Buyer Persona for better PPC strategy success. Understanding & Implementing the basic AdWords tool called AdWords Express. Static & Dynamic keyword insertion adcopies. Creation & implementation of Conversion Tracking Code. Linking of Webmaster, YouTube & Analytics with AdWords. Search & Display Network Campaign Targeting. Buy Qualified Traffic – Pay per click advertising results are instant and deliver highly targeted motivated traffic. These visitors are keenly looking for the products or service you have to offer. Targeted Traffic – All PPC ad campaigns permit you to target specific subsets of searchers, especially Ad Retargeting, which displays your ad to someone who recently visited your website. Niche Market Strategy– The advantage of niche marketing is that you can target your pay per click PPC advertising campaign to reach exact niche markets, days of the week, times of the day, and target specific cities or specific countries. Seasonal Marketing Strategies – You can decide to run your pay per click ads during a slow season when you need more sales or simply turn your PPC ads off. You can increase your pay per click advertising during a busy holiday season when you know people are actively searching and buying. With PPC ads you also have the litheness to set what hours and what days your ads will be displayed. Double Branding Experience – Many brands with top search engine listings will also run PPC ads to get their website listed twice on the first page of the search engine results – achieving a top Paid Ad listing along with their top organic listing. Measurable ROI– This is one of the biggest benefits of pay per click advertising. Using PPC analytics you can measure your pay per click campaign results for return on investment and immediately determine what is working and what is not working. All our Trainers are working with companies such as Tech Mahindra, TCS, HCL Technologies, IBM, Birla soft, L&T InfoTech, Cognizant and Cap Gemini. Trainers are also helping students to get placed in their respective company by Employee Referral / Internal Hiring procedure. Webliquidinfotech associated with top establishments like HCL, Dell, Birla soft, TechMahindra, TCS, IBM etc. make us proficient to place our students in top MNCs across the globe. HR team also conducts sessions for personality development, how to interact with interviewers, how to speak English, how to handle & control nervousness & how to represent your point of view in front of the interviewer. After completion of 70% training course content, we will arrange the interview calls to students & prepare them for F2F interaction. Schedule Mock Exams and Mock Interviews to find out the GAP in student’s Knowledge. Provide Job Portal Credentials so that the aspirants can apply for the job. Personal Attention to every student for PPC Google AdWords Training. Training will be conducted on the daily & weekly basis and also, we can customize the training schedule as per the candidate requirements. 100 % free personality development classes which include Spoken English, Group Discussions, Mock Job interviews & Presentation skills. Webliquidinfotech is the most credible training institute for PPC Google AdWords. We have a bunch of experienced trainers who will guide you through the core concepts of PPC Google AdWords. Quality of teaching is the most important which cannot be overlooked. Quality is something that cannot be explained verbally, rather it needs to be experienced, So, don’t wait anymore attend our free demo class from our industry experts and see how different we are from others.